Getting into Public School, or Scary Entrance Examinations from the 1880s! 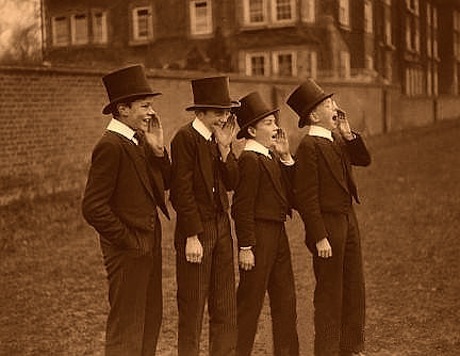 Eton There are seventy scholars always on the Foundation; and the average number of yearly vacancies is about twelve. Election to these takes place annually on the last Monday in July. Candidates must be between the ages of twelve and fifteen, and for permission to compete application must be made to “The Clerk of the Governing Body, Eton College, Windsor.” The subjects of examination are Latin Composition (Prose and Verse); Translation from Latin and Greek; Mathematics (including Arithmetic, Algebra, and Euclid); and ” General Papers ” (whatever these may mean), not limited to Latin and Greek Grammar and Parsing. The examination varies according to the age of the candidate, who is permitted the use of Dictionary, Gradus, Greek Lexicon, and Grammars on the Composition and Translation papers. Once elected to the Foundation, or “into College,” as it is termed, a boy’s expenses are purely personal, as he will receive free board and education within the College walls. But even this would probably mean, at an aristocratic school like Eton, an expenditure of hardly less than £60 a year on the parent’s part. Winchester College has also seventy Foundation Scholarships, with eleven yearly vacancies, open to competition of boys of twelve to fourteen years of age, whether already in the school or not. Every candidate must give notice of his desire to compete on or before the last day of June in each year, by letter addressed to ” The Rev. G. Richardson, M.A., The College, Winchester;” and the examination is held in July. The subjects of examination are Elementary Religious Knowledge; Dictation; Arithmetic, Algebra, and Geometry; Latin Composition (Prose and Verse); Construing and Parsing in Greek and Latin; French Grammar (Parsing and Easy Translation); Outlines of Geography and English History. Each scholar pays yearly £21 in advance: i.e., £7 at beginning of each term. This done, he is maintained during his whole stay at “Winchester out of the College revenues. Rugby the Scholarships are two Classical of £80 a year each; two Classical, one Mathematical of £50 a year each; and one Classical, one Mathematical, one French, one Natural Science of £20 a year each. Candidates must be under fifteen on July 1st. Allowance for age is made in election to all Scholarships; no special books are suggested; “the papers are set (so say the authorities) with a view to well-taught boys between thirteen and fourteen.” We may estimate the exact value of these Scholarships as follows:—The annual expenses of a boy’s board and education at Rugby School amount to £119 7s. Deduct from this sum the value of a Scholarship as above, and the result shows the annual cost with such help allowed. It will thus be seen that, under the most favourable circumstances, a Rugby “Scholar’s” education costs not less than from £40 to £50 a year, exclusive of travelling and pocket-money. Harrow of the six Scholarships annually offered, some are of not less than £60 a year, the rest of not less than £30 a year. Candidates must be under fourteen on January 1st previous to election. The subjects of examination on the Classical side are Translation from Latin and Greek, and Latin Composition (Prose and Verse), with permission to use Dictionary, Gradus, Lexicon (but not Grammar) in the preparation of the exercises. On the Modern side the subjects are Mathematics (including Arithmetic and easy Algebra, and Euclid), French, and any one subject either of History or Science. The ordinary annual expenses of a boy’s board and education at Harrow School never fall short of £113. So that here again, under the most favourable circumstances—that is to say, with a Scholarship of £60 a year to help him- along, the cost to his parents will never fall below £53 a year, exclusive of personal expenses. EXAMINATION PAPERS SET TO BOYS BETWEEN 12 AND 16 YEARS OF AGE, CANDIDATES FOR ELECTION TO THE FOUNDATION OF WINCHESTER COLLEGE, JULY, 1882. I. Find the G.C.M. of 5325 and 8307; the L.C.M. of 34, 68, 17, 2. V. A man owes £360 16s. 3d., and can only pay £240 15s. 6d. ; how much is this in the pound? VI. A rectangular piece of ground of 780 square feet area was sold for £25,050; the cost was said to be £1,565 10s. for each foot facing the street: how many feet frontage were there? At the same rate how much would the land cost per acre? Show that a square plot one acre in extent measures nearly 69 1/2 yards each way. VII. A man has an income of £558 2s. 6d. after paying 5d. in the £ for tax: what was the original income? If the income arises from 3 per cents, at £95, what is the value of his estate? VIII. Find the difference between simple and compound interest on £2,784 15s. for three years at 4 per cent. IX. A mixture contains 1 pound of A, 24 1/2 pounds of B, 2 pounds of C, 12 1/2 pounds of D: find how much per cent, there is of each. X. A man in discounting a bill due three years hence, at the rate of 5 per cent., found the true discount on one year, and multiplied it by 3: by what fraction of the whole bill was he wrong? V. The pth term of an arithmetic series is u, the qth term of the same is v; find the 7th term. VI. If two angles of a triangle are equal to one another, the sides also which subtend, or are opposite to, the equal angles, shall be equal to one another. VII. If two sides of a quadrilateral figure in a circle are parallel, prove that the other two must be equal. VIII. Inscribe a circle in a given triangle, and a circle in a quadrant of a circle. IX. Show how to divide a given line into seven equal parts. X. Find the area of a triangle which is equilateral and has the three sides together equal to the four sides of a square whose area is a2. EXAMINATION PAPERS SET TO BOYS UNDER 13 YEARS OF AGE, CANDIDATES FOR ELECTION TO THE FOUNDATION OF WINCHESTER COLLEGE, JULY, 1882. They talk with one another in manifold conversation. Now lies covered with dust on the foul ground. As he desires to rise his feet had no power. And though he willed it not, his cheeks grew moist. Did the fates of black death lay hold on Argus. So great was the consternation of the inhabitants of Londinium, when the news came that Jumbonius must leave the shores of England, that not even the judges and senators could refrain from openly expressing their grief. Added to these the voices of women and children were heard, exclaiming that now they were being shamefully deprived of their chief pleasure. “How long,” said they, “must we endure such wrongs? Do not imagine, O Prefect of the gardens, that thy deceit is unknown. Thou hast sold for money to foreigners the joy of our children, the pride of our native land, the consumer of sweetmeats. What can be more disgraceful than for a noble animal, whom we all love, to be enticed against his will into a cage, exposed to the waves of the Atlantic, and delivered to the unknown tortures of his enemies?” To these complaints the Prefect replied that the money had been paid, and that the purchaser asked if it was just that so many thousands of the citizens of the great republic should be defrauded of the spectacle, which had now long since been promised to them. I. What is a glacier, an iceberg, a spring, a springtide, dew? II. Draw a map of Italy, marking the chief ranges of mountains, rivers, and twelve important towns. III. In what countries, and on what rivers, are the following towns:—Dresden, Oporto, New Orleans, Alexandria, Nijni Novgorod, Rustchuk, Montreal, Cordova, Rangoon, Liverpool? IV. A Russian gentleman, averse to railways, wished to go from St. Petersburg to Odessa; name, in order, the seas and straits through which he would have to pass. I. The chief events of the reign of Edward I. giving the dates as nearly as you can. II. In what English reigns do we hear the most of Ireland? Give a short account of the leading events connected with it. III. With what events do you connect the following places:—Worcester, Runnymede, Torbay, Glencoe, Evesham, the Nore? IV. Who were Jack Cade, Judge Jeffreys, Sir W. Wallace, Clive, Titus Oates, Sir Walter Raleigh, Lord Raglan, Anselm? Posted in Boys | Comments Off on Getting into Public School, or Scary Entrance Examinations from the 1880s!